In the interview section of the extras disc, Ian Anderson of Jethro Tull remarks upon how buying a Moody Blues greatest hits collection he was surprised at how many tracks he recognised, I felt the same in the course of this film. Back when I was a boy, the great Alan Freeman had a radio show in which he would in the course of things play an obscure album track which his listeners had to identify to win a prize, we used to tape these programmes, in breach of several minor laws, and one day in the mid-1970s one of my friends came to school with a jaunty little track about Dr Livingstone emerging from the jungle gloom which we agonised over, but were unable to identify. Some years later in Manchester, my flatmate Lance played me some of In Search Of The Lost Chord, the 1968 album by The Moody Blues, and was outraged when I told him the story; how had I not recognised this classic album? Lance later disappeared into the Hare Krishna movement in Salford and I was never to see him again, and I have never listened to The Moody Blues until this day. How was it that a bunch of switched-on teenagers, in the heyday of progressive rock, had failed to recognise a track from an album that, with its forerunner Days Of Future Past, was part of the canon of work that allegedly kicked popular music up to the next level? Well this film goes some way to answer that, in that the band themselves, and particularly guitarist John Lodge, say The Moody Blues defied categorisation; neither folk nor pop nor rock nor prog, but all those things. The Moody Blues see their category-spanning status as a plus, and one of the keys to their longevity, particularly in the USA where they continue to be a big thing, but it must be said it is precisely that indefinable nature that means they are not part of the pantheon of rock greats in the UK, that and our abiding animosity to wispy hair. It is notable that The Moody Blues are responsible for one of the great over-played tracks of all time, Nights In White Satin, the other would be A Whiter Shade Of Pale by another 'where do they fit in' band, Procol Harum, also notable is that these songs are so fixed in our collective psyches we perhaps forget what superb songs they are. The film itself follows the fortunes of the band, through various incarnations, from their origins in Birmingham, through fame, hiatus, and eventual world-touring return. An executive from the Decca label points out that the band members were thoroughly nice chaps, and so they appear here, relatively unspoilt and refreshingly accessible to their fanbase. There is little evidence of animosity even when personnel have gone their separate ways; Denny Laine claims to have come up with the name but we can discard him for his association with A Wonderful Christmas-Time, there are clearly outstanding issues between drummer Graeme Edge and original keyboard player Mike Pinder but the film is not used as a platform for ire. 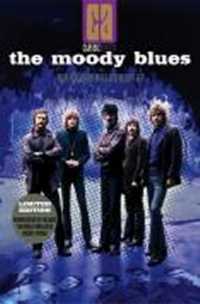 If you are not already a Moody Blues fan this film is unlikely to convert you, it is essentially a footnote to rock history; the big issues revolved around The Beatles and The Rolling Stones, Pink Floyd, Cream, Led Zeppelin, et al; The Moody Blues crafted well-written melodic songs and gave good shows, despite services to stereo they didn't in the end, and despite some modest claims here, change the course of popular music. The lack of scene selection means you have to pretty much watch the main feature all the way through or else use the jump button to find your place if you watch it over a handful of sittings. The extras' disc has chapter headings but again no scene menu means you have to skip through it to find bits. The extras disc features anecdotes, extended bits of interviews from the main feature, and a few music videos.